An evidence based approach to practicing neuro-nurturing care in your NICU. Click the button to Watch the Recorded Sessions and Download the Course Workbook! Click THIS COURSE to purchase the $49 payment option and earn CEU credit. The number of neuro-focused neonatal intensive care units (NeuroNICUs) is expanding globally. NeuroNICUs strive to integrate the latest in technology and research into practices that nurture vulnerable, developing brains. This online course is focused on transforming every NICU into a neuro-nurturing NICU. Participants will gain knowledge, inspiration, and a practical plan to reinvent bedside practices that can improve outcomes for all NICU infants and families. Describe the trend of NeuroNICUs in the US. 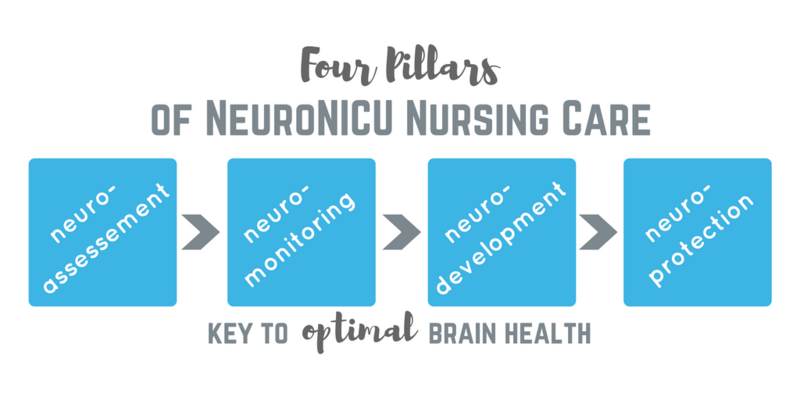 Outline the four pillars of Neuro-NICU care. List three neuroprotective bedside practices. Discuss the options for neuromonitoring at the bedside and two populations that could benefit from. Describe one inter-disciplinary partnership that needs to be strengthened in your NICU. Create an implementation plan for one care practice that can improve neuro-developmental outcomes for infants or emotional health for parents.